This is a new release and a long awaited one as this defense game is one of the most top rated and complex. 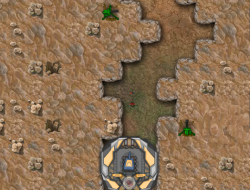 Your job is to of course defend your base which is located in some tough to reach places in the depths of the canyon, but it seems that the enemies have developed artillery that can easily break the defense lines if you dont build some turrets that will try and kill them as soon as they go in range. To do this you need some money and on each level a small amount will be given to you and you need to make sure that you put them to good use. Canyon Defense 2 10.00 between 0 and 10 based on 1 votes.